CSMCRI Notification is out. CSMCRI is recruiting for 24 Junior Research Fellow/ Project Assistant Govt Job Posts. You can check CSMCRI - Central Salt and Marine Chemicals Research Institute last date, download CSMCRI notification, visit CSMCRI official website and check other CSMCRI Vacancy details.Complete Vacancy and recruitment Details about 24 Junior Research Fellow/ Project Assistant Govt Job vacancies in CSMCRI are provided below by JobSarkari.Com only for you. Date of Walk in Interview. 13/02/2019. Project Assistant Level-I. Candidate Must Have Passed B.Sc in Chemistry With 55% Marks. 03. Project Assistant Level-I. Candidate Must Have Passed Diploma in Fabrication Engineering With 55% Marks. 01. Project Assistant Level-I. Candidate Must Have Passed Diploma in Civil Engineering With 55% Marks. 01. JRF/ Project Assistant Level-II. Candidate Must Have Passed M.Sc in Chemistry With 55% Marks. 12. JRF/ Project Assistant Level-II. Candidate Must Have Passed B.E/ B.Tech in Civil Engineering With 55% Marks. 02. JRF/ Project Assistant Level-II. Candidate Must Have Passed B.E./ B.Tech. in Mechanical Engineering/ Renewable energy / Energy Systems and Technology/ Environmental Engineering or M.Sc. in Renewable Energy With 55% Marks. 01. JRF/ Project Assistant Level-II. Candidate Must Have Passed BE/ B.Tech in Mechanical Engineering With 55% Marks. 01. JRF/ Project Assistant Level-II. Candidate Must Have Passed B.E/ B.Tech in Chemical Engineering With 55% Marks. 02. JRF/ Project Assistant Level-II. Candidate Must Have Passed BE/ B.Tech in Environmental Engineering With 55% Marks. 01. Project Assistant Level-I. Max 28 Years. JRF/ Project Assistant Level-II. Max 30 Years. 3. Candidate Need to Fill All the Details in Application Form And Need to Attach Copy of All Scanned Documents As Mentioned in Notification. 4. Candidate Need to Go on Given Address on 13th February 2019. CSIR-Central Salt and Marine Chemicals Research Institute, G. B. Marg, Bhavnagar-364002 (Gujarat). Q. 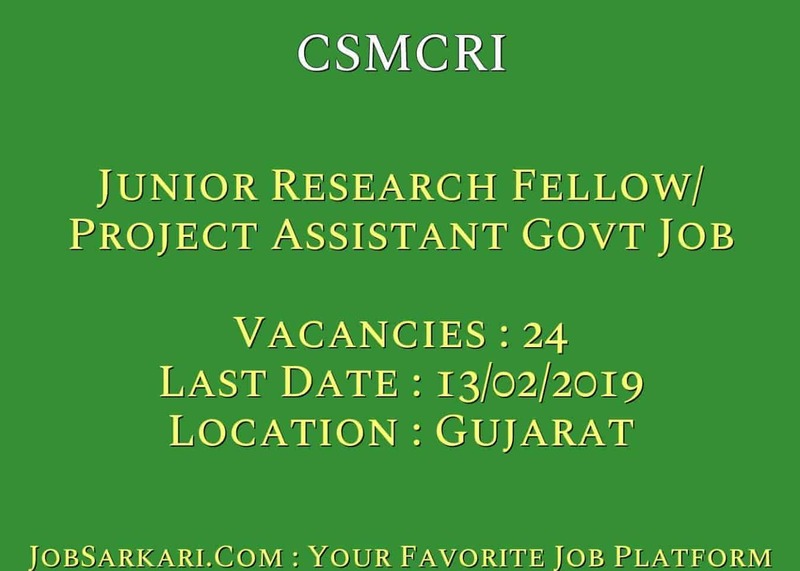 What is the Last Date For CSMCRI Junior Research Fellow/ Project Assistant Govt Job Vacancy ? A. 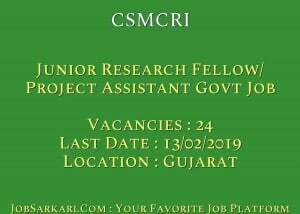 Last Date for CSMCRI Junior Research Fellow/ Project Assistant Govt Job Posts is 13/02/2019. Q. What is the Form Type of CSMCRI Junior Research Fellow/ Project Assistant Govt Job Recruitment ? A. The Form Type for CSMCRI Junior Research Fellow/ Project Assistant Govt Job Posts is Offline. Q. How many vacancies are available in Central Salt and Marine Chemicals Research Institute Junior Research Fellow/ Project Assistant Govt Job Posts ? A. There are about 24 Vacancies in Central Salt and Marine Chemicals Research Institute Junior Research Fellow/ Project Assistant Govt Job Posts. Q. What is the Full Form of CSMCRI ? A. Full Form of CSMCRI is Central Salt and Marine Chemicals Research Institute .